The movie you are about to see is not all science fiction. It is based upon medical technology which currently exists for fetal growth outside the womb. It could be a possibility tomorrow ... or today. 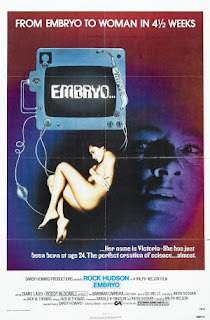 Thus begins the 1976 science fiction horror movie Embryo. Sounds sciency! The movie is an update of the Frankenstein story, where a scientist (played by Rock Hudson) develops a process where an embryo can be grown from fetus to beautiful adult woman (played by Barbara Carrera) in just over a month. Supporting roles are played by Dianne Ladd, Roddy McDowell and Dr. Joyce Brothers. I don't think it's to much of a spoiler to mention that eventually everything goes horribly wrong. But what about the promised science? The quoted Charles R. Brinkman III, MD turns out to have been an actual authority on pregnancy, rather than a mere figment of the filmmakers' imagination. At the time the movie was released, he was a Professor of Obstetrics and Gynecology at UCLA (and is now an Emeritus Professor), with an extensive list of scientific publications. But despite his expertise, he seems to have exaggerated the state of medical technology. Here we are, 35 years after Embryo was released and artificial wombs are still more science fiction than science fact. There has been progress: Nick Otway and his team of fisheries biologists in Australia recently developed an artificial uterus for growing grey nurse shark embryos. But despite continuing research, growing even small mammals like rats and mice outside the womb has not yet been fully successful. Even if artificial wombs for non-human mammals are developed, ethical and political concerns make it unlikely the research will be extended to human embryos. That's not to say it won't eventually be possible to grow a human baby in vitro, but it isn't going to happen any time soon. And, of course, there isn't any sort of scientific basis for the movie's acceleration of development and aging to allow human embryos to reach adulthood in a month. That is likely to remain science fiction. So not too surprisingly, Embryo doesn't have a solid scientific basis. But it does have Rock Hudson and a pretty girl monster. That's not too bad for a cheesy B movie. You can watch Embryo for free at the Internet Archive (also embedded below). Note that the uploaded film was "sourced from a 30 year old Betamax tape", so the picture quality isn't very good. Or for a version with better quality visuals, you can watch Embryo through Amazon Instant Video or add it to your Netflix queue. My novel The Scorpion, set in 2045, uses cloning and rapid growth to adulthood to allow the antagonist, an uploaded terrorist, to penetrate security around a number of installations. Will such a technology be perfected by then? Don't know, but we seem to develop some technologies well before predicted, while others don't develop much at all. I do believe there is a biological and biochemical basis for such tech. Some animals grow to great size in short periods of time compared to humans. Horse gain six or seven hundred pounds in about a year, and dogs and cats are mature in a year.